It feels like summer vacation just started. You’ve barely cleaned out your kid’s backpack from this past year. You still have friends’ graduation parties to attend. You haven’t even taken a vacation. But the calendar does not lie, my friend. Now that July 4 has passed us, back-to-school ads and school-supply aisles are coming whether you like it or not. But don’t despair. There’s still some summer to enjoy. 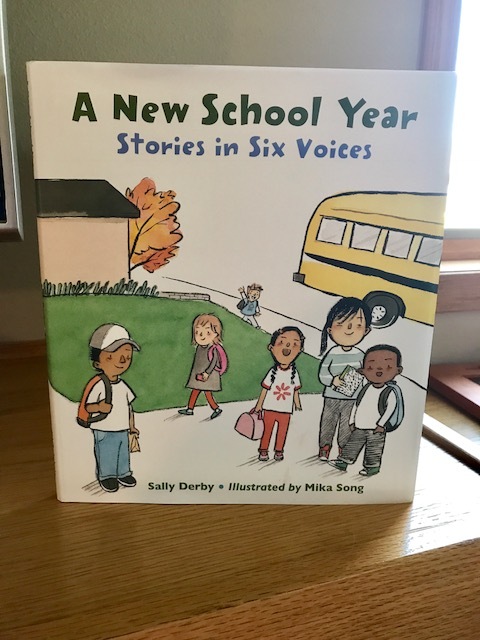 And when you absolutely must think about going back to school, Sally Derby has the perfect picture book to help you do it — A NEW SCHOOL YEAR: STORIES IN SIX VOICES (Charlesbridge, 2017) illustrated by Mika Song. This is a sweet, heartfelt collection of free-verse poems told from the view of six students — from kindergarten through fifth grade — who are getting ready for the new school year. They’re a mix of kids from a mix of families who each have very real reasons to be excited and nervous about the upcoming year. Miss Kring won’t be my teacher for second grade like I wanted. Instead I’ll have a new teacher, someone I don’t even know. The letter said his name is Mr. Patterson. Teachers at my school aren’t called Mr. Their names begin Miss or Mrs. Like they’re supposed to. Last year, I knew everything about kindergarten. I knew all the kids and the teacher. I knew which was my seat and how to ask to use the bathroom and where it was. Now I have to learn everything all over again. What if I make a mistake? I read an article once suggesting that when your child was worried, you should ask them if this was a big worry, a medium worry or a small worry with the goal of helping them see that many worries really are small. I could totally see teachers reading this book to their returning students and having them share or draw or write what parts of coming to school worried or excited them. As a reader, this book is for you if you’re a teacher or a librarian or a parent or simply someone who remembers going back to school. As a writer, this is the type of story I aspire to write. Simple. Heartfelt. Eminently relatable and true-to-life. Betsy Bird reviewed the book recently and called it, among other things, “cuddly and utterly essential.” I could not agree more. And, Charlesbridge created a blog post and video describing how the art for this project was made. It’s also worth checking out. So add this to your cart when you’re stocking up on glue sticks, spiral notebooks, Kleenex and crayons. Back to school, Charlesbridge, Fiction, Heart, Mika Song, Pat Zietlow Miller, picture book, poetry, Sally Derby. Bookmark. This sounds wonderful. I am falling more and more in love with poetry for children. Would have never thought to write this collection, but I can’t wait to read it! Those getting ready for school days are behind me, but the memories remain. Great book to share so that kids know they aren’t the only ones a little worried about the new school year. This sounds like a wonderful books all kids will enjoy and relate to. Congrats! I love the idea of having several kids with very different outlooks on the school year. A great book for any child getting ready for another school year! Thank you, Pat, for sharing this book with us. For me, it will most definitely be a mentor text! Can’t wait to see it! Aww, this brings back so many back-to-school memories! Thanks, Pat. I look forward to checking it out. Back to school will be here before you know it. This may be just the book to read to sooth my grandchildren’s worries about back to school. This book seems to really capture the first day experience. I remember having some of these same worries myself. I already love this book. Kids always worry about a new school year. The “what ifs” are very real. So a week before school started, I’d send each student a postcard welcoming him/her to my class. Excellent. Thanks for sharing about this new book. I’m already back to school shopping for my class! What a creative presentation of a universal concept! Thanks for pointing it out, Pat, I’m anxious to read it! “Simple. Heartfelt. 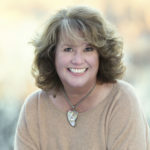 Eminently relatable and true-to-life.” I agree wholeheartedly with your writing goals, Pat. I’d only add smile-worthy for those of us into humor.